Form the dough into a ball and roll out on a floured surface until very thin and about 10 inches in diameter. When ready to use pizza dough remove the dough from the refrigerator. Let it sit at room temperature to warm up. This will take about 2 hours. Place a pizza stone oven and bring the temperature up to 500 degrees F.
Divide the dough in half and rolling one-half into a 10" circle on a lightly floured surface. Place the dough onto a pizza pan or a pizza peel that will be used to slide the dough onto the hot pizza stone. Be sure to flour the pan or pizza peel liberally with flour so that the assembled pizza will slide off easily. For each Pizza: Brush 1 tablespoon olive oil over each circle of pizza dough. Spread 3/4 cup mozzarella cheese over oiled dough. Sprinkle 1/4 cup bacon over cheese. Place 8-10 tomato slices over the bacon. Sprinkle tomatoes and bacon with 1/4cup of mozzarella. Transfer pizza to oven. Bake until golden brown and cheese is bubbly at the center of the pizza. Carefully remove pizza from oven and slice into 6 pieces. Mix 2 tablespoons mayonnaise with 1 1/2 cup chopped romaine lettuce. 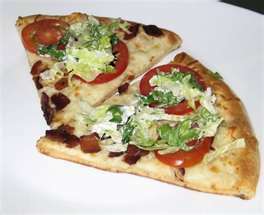 Spread lettuce mixture over pizza and serve.